Working Preacher, Luther Seminary, commentary, podcast. "It's All a Joke!" Kristen Leigh Southworth, Modern Metanoia, 2018. "The Bottom Line," Modern Metanoia, 2016. "Holy Saturday: The Great Sabbath," Suzanne Guthrie, Soulwork toward Sunday: At the Edge of the Enclosure, 2013. Sermon Notes for Holy Week, Michael Rich, In-Formatio, 2012. Crafting the Sermon: The Easter Vigil, Melinda Quivik, WorkingPreacher.org, 2010. Dylan's Lectionary Blog, Easter Vigil/Principal Service of Easter, 2007. Biblical Scholar Sarah Dylan Breuer looks at readings for the coming Sunday in the lectionary of the Episcopal Church. Notes on the Easter Vigil, Six Stories for the Easter Vigil, Rev. Thomas L. Weitzel, Evangelical Lutheran Church in America. Wellspring of the Gospel, Easter Vigil, Catherine McElhinney and Kathryn Turner, Weekly Wellsprings. Vigilia Pascual (A, B, C) – 2015 por E. Rvdo. Enrique Cadena, Sermones que Iluminan. "Now What?" the Rev. Anjel Scarborough, Sermons that Work, Episcopal Digital Network, 2014. Vigilia Pascual (A) â€“ 2014 – 2014 POR EL. RVDO. ANTONIO BRITO, Sermones que Iluminan. "No Idle Tale," the Rev. Dr. Frank Hegedus, Sermons that Work, Episcopal Digital Network, 2013. Vigilia Pascual (ABC), el Rvdo. Dr. Alvaro Araica, Sermones que Iluminan, 2013. Bible Study - Easter Vigil - verse by verse Roman Catholic lectionary commentary at St Charles Borromeo Catholic Church, Picayune, MS.
Worship Planning Helps (Holy Saturday/Easter Vigil): Worship & Preaching Notes, Hymn Suggestions and Worship Resources from the United Methodist Church General Board of Discipleship, 2013. The Great Vigil of Easter, worship resource, Rev. Bosco Peters. Liturgical Planning and Music Suggestions, Easter Vigil, CanticaNova Publications. 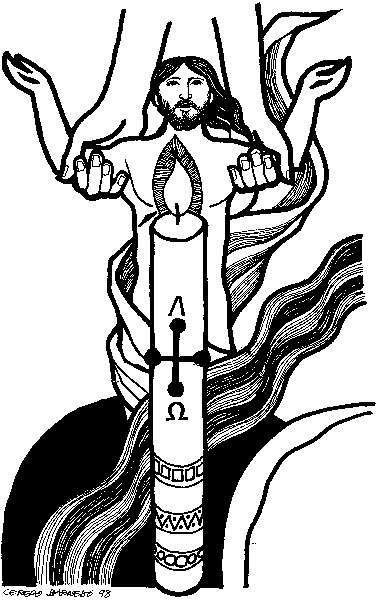 Prayers of the People, Easter Vigil, General intercessions for Sundays and Feasts, by Ormonde Plater, Archdeacon of the [Anglican/Episcopal] Diocese of Louisiana. The Time of Cups - for the End of Easter Vigil, Theresa Coleman, reverend mommy's random thoughts. 21st Century Worship Resources, Holy Saturday/Easter Vigil, UMC GBOD, 2013. Offertory Prayers, Holy Saturday/Easter Vigil, UMC GBOD, 2013. Easter Vigil at Cerezo Barredo's weekly gospel illustration. Follows Latin American Roman Catholic gospel reading, though most gospels texts/themes are found in the index. Liberation emphasis. Hymnary.org: Easter Vigil, Year A, Year B, Year C, hymns, scores, media, information. Shepherd Sounds, Easter Vigil. Background information for hymns and choral music following the lectionary from the Episcopal Church of the Good Shepherd, Austin, Texas, by Eric Mellenbruch and David Zersen. Abraham Journeyed to a New Country, Carolyn Winfrey Gillette, BUNESSAN 5.5.5.4 D ("Morning Has Broken"), A hymn for the church?s ministry with immigrants. Lectionary Hymns, Easter Vigil, National Association of Pastoral Musicians. "Listening to Mary," Good Friday/Easter Vigil dramatic monologue, Theresa Coleman, Reverend Mommy's Random Thoughts. "The Easter Vigil and Children," Carolyn C. Brown, 2014.